In 2005 I spotted an ad for an initiative to set up a number of LGBT sports groups in Edinburgh. I had really enjoyed badminton at school and was keen to be part of establishing a friendly, welcoming group at Meadowbank which celebrated diversity as well as helped members improve their fitness and badminton skills. 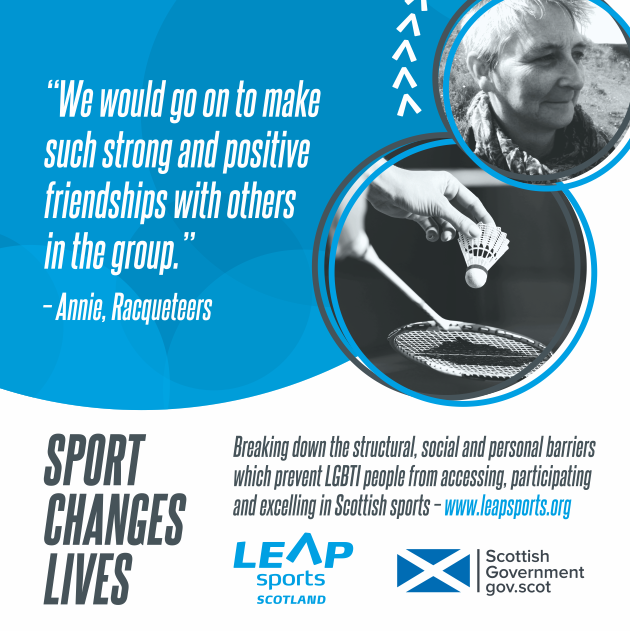 It was fantastic to be part of a group of folks with the focus on having fun, making new friends, and taking part in sports in an atmosphere which felt safe and free from gender restrictions or assumptions re age, race, sexuality or ability. The group is well run and supportive. Little did I know the first evening that I went along that I would meet the woman who became my life partner (and is a demon on the court); that we would go on to take part in competitions with other LGBT badminton teams from around the UK and Europe, and that we would go on to make such strong and positive friendships with others in the group. The group is always evolving, as members move away or take a rest and new members join. New members are always welcome with the Tuesday group available for beginners and the Thursday for more experienced players. We are currently particularly keen to encourage more women to join. It is great that there is flexibility for folks to come along purely for the joy of the game, or to get to know other members. It’s a great way to unwind after work and to celebrate competitiveness, diversity, and the buzz of racing about the court. The Racqueteers is an LGBTI badminton club which meets every Thursday from 7-9pm at Meadowbank Stadium. The group plays more at an intermediate level and takes part in some friendly competitions. Come along, have fun, enjoy meeting the other members for a friendly game and a social get-together afterwards. Email: info@theracqueteers. Written on 9th January 2017.